laughing at each other as eggs dripped from their noses, fingers and shirt hems. But you know what? Those moments of crazy, no-rules egg throwing released the anger, stress and frustration of trying to survive. It was after such crazy moments that they found a common ground and could agree on issues they could not previously. And, just as importantly, they kept us kids out of it. We fetched eggs, but we were not allowed to join in because, oddly enough, the whole thing was about the grown-up world, even though, for just a few moments, they acted like children to get there. Looking at the world today, I cannot help but think how wonderful it would be to see adults let their guards down, lob a few eggs, get hit by a few, and laugh. Laugh like they haven’t since childhood and reconnect with the humanity that we have all misplaced and need to find. If you think this is a bad time to sell your house, you might want to reconsider. From soap box derby racer to scholar, Alexis Willard was taught to stand tall, even if she is one of the few girls on the track. ON THE COVER: Alexis Willard at Buckeye Public Library carrying books covering just some of her interests. Several sources cause moisture in a house, giving mold just what it needs. A recipe for helping those in need. A quick bread to enjoy today and great for freezing for winter. A coveted dish in the past, liver has protein, B12 and essential amino acids. Great non-profit events throughout the county, including golf outings, runs, walks, and farmers markets. Why, there are more things to do than you can shake a stick at! ones to beat,” she said, with a huge smile. After her years of being a tough competitor in the soap box derbies, Willard decided to pursue a law degree with which she planned to help women and to also learn Russian. Plans, as they tend to, changed when her father broke his leg in a skiing accident in New York last winter. There were numerous complications for Thomas Willard, including the installation of a rod along his leg and an infection that necessitated another operation to remove infected tissue. In order to move him from New York to a Cleveland hospital, a friend’s car was borrowed that was roomy enough so Thomas Willard’s leg, forced by the rod to be straight out from his body, would fit into the car. Following her father’s accident, Willard rethought her future. After spending time visiting her father in the hospital, she realized she always had liked being in a medical atmosphere, and she loves science. While she still is considering including Russian in her studies, she has changed her major to neuroscience. “I want to do something in the medical field,” said Willard. “I want to help people.” Her mother’s career might have had some influence on Willard. Carri Gerber is a biology professor for Ohio State University at the Wooster campus. Throughout high school, Willard volunteered for Big Brothers Big Sisters, Project Care, the school library, and as aide to school administrators. Although she currently is preparing and packing for college, Willard previously has worked at Bob Evans, the Regal Medina Stadium 16 and Pet Supplies Plus. Her interest in learning Russian comes from her love of the language and culture, she said, even though she is not Russian. Willard said she might trade Russian for sign language because she is fascinated with it as well. Russia is not the only culture she is interested in, Sweden also has been in her focus because her boyfriend, Philip Jansson, lives there. He visits as often as he is able. Recently, Willard was counting down the days until his next visit. She is planning to travel to Sweden during her college winter break. Willard and Jansson have been friends for five years and started dating 1 ½ years ago. She said they met on Instagram through interests they had in common. Jansson is employed as a high-voltage electrician in Sweden. Willard is a 2018 graduate of Buckeye High School and has earned approximately $28,000 in scholarships to attend DePaul University in Chicago. She said the scholarships almost cover tuition but do not cover any other expenses, such as housing. With a graduating grade point average of 4.2, more than 29 college credit hours earned, numerous scholarships, and her not believing in letting anyone slow her down, in August, Willard will start showing DePaul University just how determined she can be. When she was interviewing for one of her scholarships, Willard said it was older men conducting the interview. When they started asking about her soap box derby competition, they were in for a surprise. “They assumed my dad had helped me build my cars, and they were shocked when they found out it was my mom,” Willard said. She remembers her soap box derby days with a big smile and is looking forward to conquering the challenges ahead. Alexis Willard and her mother, Carri Gerber, pose after Willard's 2012 Winston Salem win. Photo provided. In 2011, Alexis Willard was the top point earner and rookie of the year for the National Derby Rallies. Photo provided. Thomas Willard, Alexis Willard and Carri Gerber after Alexis placed fifth at a DQ race in 2015. Photo provided. Gardening is hard work, but there is always time for some fun! Kobe Walter gives his sister Kali Walter a break. Bethzaely Head guides her sons, Andre Head, left, and Antonio Head in the Feeding Medina County garden. Feeding Medina County recruited teenagers to grow food for the hungry in its garden at 901 Lafayette Road, Medina. With a smile and a shovel, Ron Maitland, Feeding Medina County garden coordinator, enjoys his work. Volunteers work spreading newspapers topped with compost to deter weeds. From left: Kitty Hinkle, Buckeye Public library associate; Bethzaely Head; Andre Head; Mohammad Rashid, standing in the background; 10-year-old Kali Walter; and 13-yearold Kobe Walter. Mohammad Rashid, 16 years old, spreads compost in the garden. Eight-year-old Nora Palumbo practices her newly learned knitting skills with Eleanor Gentry, who taught Palumbo to knit during a Knitting and Crocheting Circle meeting at the Brunswick Public Library. Edwin Ortiz, 12 years old, hauls and spreads compost while his 14-year-old sister, Olivia Ortiz, supervises. Having fun at the Knitting and Crocheting Circle are Derek Corniello, his grandmother Donna Sherman, and his brother 10-year-old Travis Corniello. All aboard and off they go! Derek Corniello, 14, models a dialysis sleeve while showing a basket of completed sleeves to Angela Palumbo. The sleeves are one of the items the Knitting and Crocheting Circle donates. All aboard and off they go! People of all ages wait for a free Northern Ohio Live Steamers miniature train ride, 3654 Lester Road, Medina. For a list of upcoming ride dates, go to http://neols.net/ publicrundates.php Loving the miniature trains! In the days following our decision to go to London, I waited with bated breath for a call from my newfound sister, Lea, that never came. It occurred to me that her radio silence could mean all sorts of things, but I chose to ignore my own common sense because I needed to get away from everything one way or another. Meanwhile, Marissa convinced her parents she’d be at her friend Cindy’s house for a few days and made sure Cindy would cover for her at the cost of a new pair of shoes Cindy had been wanting. As for Devin, he didn’t have much trouble getting his parents on board with the story that he and a couple of friends were going to London for “an educational trip to a historical city,” as he put it. He also made sure everything was in order for us to be able to make the trip. He reviewed our passports to see if they were still active and usable, which they were, thankfully. He even made reservations at a hotel. It was great to have Devin on board, and I knew that as long as I had him on my side, things couldn’t go wrong. Finally, after several pretty busy days of planning and logistics, Friday came around, and we all packed to leave that night. My heart was racing as we loaded Devin’s car with our luggage and headed out to meet Marissa at the library. We couldn’t pick her up from her home since she was supposedly at Cindy’s, so we stopped at the library to meet up with her, packed her suitcase and carry-on into Devin’s car, and then headed to the airport. I formally introduced them, and they exchanged pleasantries while Devin drove and Marissa stared out the open window in the backseat. staring at my fidgeting hands. “Not about the ride. I just don’t know what to expect when we get there. I still don’t know where in London they live,” I told him, checking my phone again to see if Lea had called. Marissa stepped out of the bathroom and bounced up to us. “Ready!” “Finally. Come on, we’re cutting it close,” Devin said, grabbing her arm and pulling her toward the gates. We all rushed over and halfway there heard the last call for Flight 559. Our flight. Devin cursed under his breath and we picked up the pace. Once we got close, he snatched the tickets from my hand and waved them in the air. “That’s us! That’s our flight!” The attendant at the booth looked uninterestedly at us, half-glanced at our tickets, and let us through. We boarded the plane, found our seats, and, after Marissa’s objection to the aisle seat, got situated. “I just wanted to be next to you,” she whispered to me, once Devin turned away. She smiled softly, and I would’ve kissed her if Devin hadn’t been there. She was beautiful in the simplest way. Instead, I smiled back, yawned, and looked out the window as we took off. It was pretty cool to watch the ground fall out from underneath us. We were thousands of feet in the air, and I felt like we could do anything. We weren’t Cam, Devin and Marissa from some lame high school. We were superheroes. Soaring through the sky, heading to an unknown land with nothing but our minds, our suitcases and each other. After about half an hour, Marissa nudged my elbow and handed me a napkin. I read silently: Take to the skies, See if you can fly. We all have to try Before we die, And say goodbye. We must ask why. Why do we try? Why do we die? Why must the sky Be up so high? Why do we lie? Why do we hide? Why are we scared of What we feel inside? tioning this trip? I need to see my sister. You could’ve stayed home, but you came with us. It was your choice, so you can’t blame me for that,” I said. “I’m not blaming you! I just wish I had thought about it a little more,” she said, defensively. “My mom’s trust is important to me, Cam.” “And I’m not? !” Our whole section of the plane went silent. Not a single cough or a crinkling of a bag of peanuts. My teeth were clenched as I waited for her to answer, but I began wondering if she ever would. Her eyes were filled with tears, and although they hadn’t started falling yet, they were about to. Deep down I knew she loved me, but in that moment, it felt like she couldn’t care less. “You know you’re important to me,” she said finally, through gritted teeth. Devin got out of his seat before she even turned toward him and the aisle, and she practically ran to the lavatory in the back of the plane. Somewhere, someone yawned loudly, and the rest of the passengers returned to their small, noisy tasks. I, on the other hand, was frozen in that moment of Marissa’s look of pain. A look I had caused. I hated myself. “Hey, what was that all about?” Devin asked, taking Marissa’s seat. “I don’t know. Girl stuff,” I lied. He just glared at me. “Fine,” I said, rolling my eyes, “She was wondering if she’d made the wrong choice of coming with us. Like, I thought she cared about me.” “Of course she does, dude. Are you stupid? She’s here, isn’t she?” Devin looked at me as if I were the one who was questioning myself. “Well, she’s back there,” I said half-sarcastically, motioning toward the lavatories. Her words hit me like a semi truck filled with an overweight load of cinder blocks, and suddenly I understood. Her parents hurt her, and she blamed herself for it. She wasn’t good enough. She had done something wrong. It was her fault. I felt sick to my stomach. Luckily, we were so tired after it all that we just fell asleep. The next thing I knew, I was waking up to Devin shaking my shoulder. “We’re almost there, you should eat while you have the chance,” he said, offering me a Styrofoam plate with what looked like a plastic breakfast on it. I took it graciously as my stomach rumbled, and I motioned toward Marissa’s empty seat with a frown. “Bathroom,” Devin replied with a chuckle. “The most inopportune times,” I commented through a mouthful of eggs, trying to grin back. sure how we were splitting the beds. Devin was my best friend, and I knew he wouldn’t mind me sleeping next to him, but Marissa was kind of, sort of, almost my girlfriend, and I would’ve preferred to sleep with her. But then again, I didn’t want to impose or invade her privacy, so I started following Devin. Before I could get to his room though, she grabbed my arm and pulled me back into her room, shutting the door behind us. My heart skipped as I realized how alone we were, and how much we could get away with. “Don’t be silly, I want you in here,” she said, smiling and kissing my chin. “You sure? I can sleep with Devin if you want, I don’t mind,” I said, trying to make it clear that it was her choice. The last thing I wanted to do was to make her feel uncomfortable when she was in this position of such reliance on Devin and me. “Of course, I’m sure. I don’t think I’d be able to sleep alone anyway,” she said, hugging me tightly. “So, you’re not mad about that thing on the plane?” I asked, finally. Our little fight had been in the back of my mind ever since I woke up on the plane, and it was nice to finally get it off my chest. “No. Not really. I know you were hurt, and that’s why you said what you did. It’s okay, Cammy.” She kissed my chin again and then my lips. She had to stand on her tiptoes to reach since I didn’t tilt my head down for her, but she still kissed me for a long time. “I really am sorry, though,” I said, once she pulled away. “Shh. Shush. I don’t want to think about anything right now. I just want to get in bed and relax,” she said, ignoring my apology altogether. I didn’t get why she couldn’t take an apology, but I didn’t really like it. Someone, at some point, had hurt her worse than any sort of apology could ever make up for and that hurt me. rejoined like we were meant to be. She made a little noise, grabbed my hand, and kissed it. “I love you, Cameron,” she whispered into my fingers. “I love you, too, Marissa,” I replied, kissing the back of her head. I passed Devin, on his phone, in the common room and he looked at me questioningly. I’ll never forget how well I slept that night. It was the most perfect sleep I ever had and probably ever will have. Which was good, because the next morning was when everything started to go downhill. “Cam, Marissa, c’mon! They’re almost done serving breakfast. If you want to eat, you’ll get going!” Devin called from the other side of the door. I opened my eyes and found Marissa’s arm Want to be a part of draped over me bringing Joy to Medina with her head bent County? down into my chest. She looked peaceful, almost like an angel. But I knew that this was just a façade. She was deeply hurt and disturbed, and I was just beginning to understand this. “Hey, Marissa,” I whispered lightly, rubbing her arm. “Hmm?” She wriggled closer to Call 330-461-0589 me and leaned her head against my to make your reservation shoulder. now, before space is gone. “Breakfast time,” I said. “I’d rather just stay here,” she replied, finally opening her eyes and looking up at me. “Well, I need food, and we need to find my mom and sister, so I have to get up.” “Aww,” she whined, pulling away and letting me get out of bed. She rolled onto her back and stretched, yawning. “I guess I’ll come, too, then.” I smiled, grabbed fresh clothes and slid away to the bathroom. I passed Devin, on his phone, in the common room and he looked at me questioningly. “Nothing happened,” I said quietly, so Marissa wouldn’t hear. I didn’t want her thinking that I only wanted one thing from her because that couldn’t have been further from the truth. “Better not have,” Devin commented, going back to whatever he was doing on his phone. I just shook my head at him and went to shower and change into clean clothes. I wasn’t sure why he was being so parental toward me, but it was kind of weirding me out. We were the same age, and yet, he was basically a father figure for both me and Marissa while we were in London. I figured it was because he was the only one of us who had done a decent amount of traveling, and so we already were looking up at him (figuratively of course, since he was shorter than both of us). Whatever the reason, I had mixed feelings about it. On one hand, it was nice to have him looking out for us but, on the other, this was supposed to be a fun trip to London with friends. Yeah, it had an important purpose, but there was no reason we couldn’t have fun. Christopher Barnes is a graduate of Medina High School/Medina County Career Center and Ohio State University. Find his stories of realistic fiction and magical realism at http://cbthesurvivor. Our mission: To nurture abused and neglected children through collaboration, advocacy, treatment, and prevention. To achieve a successful mindset prior to attending a networking event, it is important to remember that at the heart of a true networking interaction is the art of meeting people and taking an interest in them. Most of the time, we do not go to a networking event with the intention of challenging someone, but it is easy to get into a situation where we may, especially since we want to get to know someone better in order to help steer potential customers their way. Often, my interest in how someone’s work helps others results in asking them questions that could sound like a challenge to what they do. It is not that at all, but it can easily sound like it. My key to keeping questions from seeming like a challenge is to make sure the person knows I have a genuine interest in knowing how they help others. It also is important to not appear challenging through your countenance, facial expressions, the look in your eyes, or tone of voice. Genuine care and interest should be beaming through. A favorite question in networking and marketing is asking someone how they differ from their competitors. Their response is usually exactly what their competitors say. Their explanation does not set them apart; it sets them amongst their competition. You want them to stand apart and be successful, so carefully drill down into their message to see if what I call the “sweet spot” can be found that sets them apart. What sets someone apart is what will be remembered when a great contact for them is standing in front of you. Challenges must be set aside, and your genuine interest must prevail for a successful networking interaction. Bob Arnold is the founder of ONward Networking and an international best-selling author. More networking tips and information are available at “Bob’s Pencil Points” blog at OnwardNetworking.com or by contacting Arnold at TheNetworkingPencil@gmail.com. If a service dog approaches you alone, call 911 and follow the dog. Service dogs are trained to go for help when their people are down and need help. A 13-hour layover in Mexico City? Yes please! Now I know what you are thinking, who in their right mind would want a 13-hour layover in an airport that does not have free WiFi? Well, for starters, I am not claiming to be in my right mind and, secondly, I see this as an opportunity to explore, and that is exactly what I did. After getting through customs, I took the train to the bus station and off I went: destination Teotihuacan, home of the Pyramid of the Sun and the Pyramid of the Moon. After the hour commute and 2 ½-mile walk, I was standing at the bottom of the largest structure in Teotihuacan and one of the largest pyramids in Mesoamerica. It was built before 300 A.D. At this point, I had to make a decision, was I going to admire this world wonder from the ground or climb the 248 stairs with swollen feet and ankles? It may have taken me longer than most, but that hike is something I will never regret. The view from the top is something that cannot truly be captured in a picture, even though I tried. Then I realized this was a moment to put the camera away and just take it all in. On the way back to the airport, I decided to make a stop at Zocalo, the main square in central Mexico City, for some authentic food. That may have been the best part of the day! I have no idea what I ordered, but it was definitely the most delicious Mexican food I have ever experienced! I am so glad I was not afraid to explore. Seriously don’t drink the water, and don’t brush your teeth with it. Climb the pyramids even if your feet are swollen, take some pictures but do not forget to put down the camera and really take it all in. I highly recommend the authentic Mexican food. It is well known that if you control the moisture, you control the mold. There are many points of moisture accumulation in a home, with basements likely leading the way in most homes. The second highest area of moisture accumulation would be the attic and points of water use such as toilets, tubs and sinks. In the attic, conditions such as poor ventilation can cause condensation on the roof deck, allowing mold to grow as a result. On other floors, kitchens and bathrooms allow for overflows, drain leaks, drips of many sorts, and even frozen and broken pipes galore. The basement is still perhaps the most complicated area to try to keep dry. Besides the piping and drains that run in and out of the basement, the foundation also is often a source of water. When it comes to the foundation, there are three sources of water. There is the surface runoff that most of us are familiar with and unprotected low spots, areas of reverse slope or houses that sit well downhill from the rest of the area, and cracks in the foundation wall where freezing ground and tree roots have put pressure on them. The two problem areas often forgotten are the water capillaries that have been in the ground since forever and the water table that often rises and falls in given areas. When the foundation begins to let water in, regardless of the cause, many homeowners run out and look for the least expensive means of waterproofing. Although any form of waterproofing is better than none, keep in mind that for the inside system to work, water must flow into and through the existing foundation wall. As it does, water will pass through the wall and add to the humidity in the basement. Some waterproofing companies will put up a vinyl wall, but that wall is not sealed at the top and relative humidity will simply flow out the top of that vinyl sheeting. It can then grow mold, despite the money spent. When possible, I recommend an outside waterproofing application over an inside one. Paul McHam is a local expert on mold remediation. For more information, visit his website at http://myairxperts.com/ and his Facebook page Moldsporewars http://bit.ly/2E2Fj3y or call 330-331-7500. OR F G N I K LOO ING TO DO? SOMETH It's time to take a look at Joy Magazine's calendar of events and LET'S DO IT! The fun starts on Page 22! Preheat oven to 350 degrees. In a bowl, combine flour, baking soda, baking powder, salt, spices using a balloon whisk. Set aside. In a mixing bowl, beat sugar, zucchini, and egg until combined. Add oil and lemon peel, beat until well combined. Gradually add flour mixture. Optional: Fold in walnuts. Walnuts can be chopped, but if you prefer large pieces of walnuts, crunch them in your hand before adding to batter. Add amount of walnuts to your preference. Pour batter into 8x4x2-inch loaf pan. Bake for 60 minutes. Makes 1 loaf. Tip: Tightly wrap extra loaves in aluminum foil and put in freezer bag. Loaf freezes well and makes a great winter treat or gift. Frozen slices are great to pack into school lunches to keep the rest of the lunch cool while it defrosts. Shredded, unpeeled zucchini also can be frozen for use later in bread, spaghetti sauce, smoothies, and soups. Before using defrosted zucchini in bread, drain off the excess fluid. In honor of Medina and Medina County’s bicentennials, Joy Magazine will be publishing a recipe each month based on recipes from the same approximate period as when the two were founded. Enjoy! In his diary entry on March 31, 1778, John Adams wrote of a fine meal he had. He stated that he was served “. . . the Lights (lungs) of a Calf, dressed one Way and the Liver another.” Liver is very healthy and, if prepared correctly, very succulent. Below is a terrific recipe. Cook the bacon, turning as necessary, until crisp. Drain on paper towels and keep warm. Sprinkle the liver with salt and pepper to taste and dredge in flour, shaking off the excess. Heat oil in a non-stick skillet large enough to hold the slices of liver in one layer. Do not overlap them. When the oil is hot, add the liver. Cook over medium-high heat until nicely browned, about 2 minutes on each side for medium rare. This author prefers it cooked well done to the point of being crispy. However, to each his own. Remove the liver to a heated plate and keep warm. Pour out the cooking oil, wipe out skillet with a paper towel, and add the butter. Cook by shaking the skillet until the butter starts to brown. Add the Worcestershire sauce. Pour the foaming butter mixture over the liver, sprinkle with parsley and garnish each serving with two slices of crisp bacon. Publisher’s note: Grass-fed cattle that has been organically raised without hormones is the best source for calf’s liver. There are local sources, to find them either go to your local farmers market (list is available in this magazine’s Let’s Do It! section) or Google: grass fed beef Medina Ohio. 8 a.m. to 11 p.m. Medina County Fair; 735 Lafayette Road, Medina. Ages 12 and up, $6; ages 11 to 2, $3; under age 3 Is free. Senior Citizens, 65 years and older, $3. 30-Minute Gate Passes until 3 p.m. Return pass within 30 minutes, $6 is refunded. Fair schedule at https://bit.ly/2sYMfX3. Fair office, 9 a.m. to 9 p.m., 330-723-9633. 9:30 a.m. to 11:30 a.m. Camp Wired; Medina Computer Lab, Medina Library, 210 S. Broadway Street, Medina. Learn and refresh computer skills. Ages 55 plus. Call for topics, 330-7250588. Sunday, August 5 Forgiveness Day https://bit.ly/2lMxeUY 8 a.m. to 8 p.m. Medina County Fair; 735 Lafayette Road, Medina. Ages 12 and up, $6; ages 11 to 2, $3; under age 3 Is free. Senior Citizens, 65 years and older, $3. 30-Minute Gate Passes until 3 p.m. Return pass within 30 minutes, $6 is refunded. Fair schedule at https://bit.ly/2sYMfX3. Fair office, 9 a.m. to 9 p.m., 330-723-9633. Fireworks at 10 p.m., no admission charge. Monday, August 6 Wiggle Your Toes Day https://bit.ly/1vaa5fL 6:30 p.m. to 7:45 p.m. Yoga Inspired by Nature; Brunswick Lake, Parschen Road, Brunswick. Bring yoga mat. Ages 10 to adult, children must be accompanied by adult. Fee $10. Register by e-mailing at lastevenson02@gmail.com or by calling 440-888-9865. 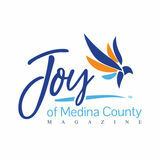 Joy of Medina County Magazine | August 2018 7 p.m. to 8 p.m. Veterans Roundtable; Medina Library, Community Rooms A and B, 210 S. Broadway Street, Medina. Veterans’ stories of survival. All Ages. No registration. 9:30 a.m. to 11:30 a.m. Camp Wired; Medina Computer Lab, Medina Library, 210 S. Broadway Street, Medina. Learn and refresh computer skills. Ages 55 plus. Call for topics, 330-725-0588. 6:30 p.m. to 8 p.m. Cycling Makes Sense Fitness Ride; Lake Medina, Highway 18, Medina. Meet in trailhead parking lot. Basic tips on cycling and bike maintenance, helmets required. Ride is 6 to 10 miles. Ages 16 and up. Free. No registration. Noon to 5 p.m. All About Bats! Susan Hambley Nature Center, 1473 Parschen Boulevard, Brunswick. Learn batty facts through crafts and activities. Happiness Happens Day https://bit.ly/2qTnau0 and Sneak Some Zucchini Onto Your Neighbor’s Porch Day https://bit.ly/1mupZbu 2 p.m. to 7 p.m. American Red Cross Blood Drive; Buckeye Library, 6625 Wolff Road, Medina. http://www.redcross.org/local/ohio/northeast 6:30 p.m. to 7:30 p.m. Computer Classes; Computer Lab, Medina Library, 210 S. Broadway Street, Medina. Computer Basics 1. Register at https://bit.ly/2l9SIdV 7 p.m. to 8:30 p.m. Chippewa Lake Water Ski Team Show Practice; Emerald Lake, 3196 Clark Mill Road, Norton. Team is based at Chippewa Lake. Bring blanket or chair to sit on hillside and watch show. Cancelled if there is lightning. https://chippewaskiteam.com/ 7 p.m. Jewelry Making; Brunswick Library, 3649 Center Road, Brunswick. Wire wrap lava stones, make pendant. Register at https://bit. ly/2MABToY EVENT IS FULL. Joy of Medina County Magazine | August 2018 5:30 p.m. to 10 p.m. Bluegrass Jam and Dinner; Lafayette United Methodist Church, 6201 Lafayette Road, Medina. Kitchen opens at 5:30 p.m., music starts at 7 p.m. Donation admission $3, dinner is additional donation request. Bring favorite dessert to share. Bluegrass bands welcome, arrive early to be scheduled. 6 p.m. to 9 p.m. End of Summer Party; Medina Library, 210 S. Broadway Street, Medina. Games, contests, button making, more. Register at https://bit.ly/2ymRpC3 9 p.m. to midnight. Moths and Meteors; Wolf Creek Environmental Center, 6100 Ridge Road, Wadsworth. Watch Perseid meteor shower and moths. Bring flashlight to moth hunt and chair or blanket to watch meteors. Park closes at midnight. Free. No registration. Saturday, August 11 Presidential Joke Day https://bit.ly/2IFOAM8 11 a.m. to 3 p.m. Northern Ohio Railway Museum streetcar rides; 5515 Buffham Road, Seville. Admission to museum is free, 10 a.m. to 4 p.m. Streetcar rides are $4 for adults and children 13 years old and up; $2 for children 6 to 12; and no charge for children under 5. http://www. trainweb.org/norm/ 11 a.m. Rockin’ Tots With Excel; Brunswick Library, 3649 Center Road, Brunswick. Story, performance, learn jazz moves, get photo with dancer. Ages 2 to 5. Register at https://bit. ly/2MraDcH 11 a.m. to 3 p.m. Sustainable Medina County Picnic; River Styx Park, 8200 River Styx Road, Wadsworth. Adults, $10, and children 12 years old and younger, $4. For more information, call Kathie Jones, 330-524-4474. Sunday, August 12 Middle Child Day https://bit.ly/2snCGz3 9 a.m. to 1 pm. American Red Cross Blood Drive; St. Martin of Tours, 1800 Station Road, Valley City. http://www.redcross.org/local/ ohio/northeast 11 a.m. to 5 p.m. An Affair on the Square Craft Fest and Vintage Fair; Public Square, Medina. Arts. Jazz music and arts and crafts show and sale. Free admission. https://bit.ly/2Kmujx1 Noon to 5 p.m. All About Bats! Susan Hambley Nature Center, 1473 Parschen Boulevard, Brunswick. Learn batty facts through crafts and activities. Tuesday, August 14 National Creamsicle Day https://bit.ly/2KBjUO1 10 a.m. to noon. Brunswick Library: Knitting and Crocheting Circle; Hickory Room, Brunswick Library, 3649 Center Road, Brunswick. Beginners welcome. Making Warm Up Medina County donations. Wednesday, August 15 Relaxation Day https://bit.ly/2tO50Pu 1 p.m. Movie Matinee; Medina Library, 210 S. Broadway Street, Medina. Popcorn and a movie. Movie to be determined. All ages. Register at https://bit.ly/2lgvtz2 2 p.m. to 7 p.m. American Red Cross Blood Drive; Advanced Health and Wellness Center, 201 Great Oaks Trail, Wadsworth. http://www. redcross.org/local/ohio/northeast 2 p.m. to 7 p.m. American Red Cross Blood Drive; Brunswick United Methodist Church, 1395 Pearl Road, Brunswick. http://www.redcross.org/local/ohio/northeast 6:30 p.m. to 7:30 p.m. Computer Classes; Computer Lab, Medina Library, 210 S. Broadway Street, Medina. Computer Basics 2. Register at https://bit.ly/2LQzy8j 7 p.m. to 8:30 p.m. Chippewa Lake Water Ski Team Show Practice; Emerald Lake, 3196 Clark Mill Road, Norton. Team is based at Chippewa Lake. Bring blanket or chair to sit on hillside and watch show. Cancelled if there is lightning. https://chippewaskiteam.com/ 7 p.m. to 8 p.m. Music at The Lodge: Brian Henke and Ginger Ackley; Lodge at Allardale, 141 Remsen Road, Medina. Folk, New Age, Celtic. Free. 10 a.m. to 11:30 a.m. Summer Wildflower Walk; Allardale West parking lot, 401 Remsen Road, Medina. Walk with naturalist. All ages. Free. No registration. A list of runs and walks that benefit area non-profit organizations. 2 p.m. Bingo; Medina Library, 210 S. Broadway Street, Medina. Join in for a few rounds of Bingo. To have your run listed, send the information to joy@blakehousepublishing.com at least two months in advance. There is no such thing as too early but there is too late. 2 p.m. to 7 p.m. American Red Cross Blood Drive; Holy Martyrs Church, 3100 S. Weymouth Road, Medina. http://www.redcross.org/local/ ohio/northeast 7 p.m. to 9:30 p.m. Crickets and Katydids in Concert; Wolf Creek Environmental Center, 6100 Ridge Road, Wadsworth. Introduction to insect musicians by Dr. Lisa Rainsong, Cleveland Institute of Music. Starts indoors, then go to an outside meadow. Bring flashlight. Free. No registration. Joy of Medina County Magazine | August 2018 National Potato Day https://bit.ly/2IDltch 11 a.m. 57th Valley City Frog Jump Festival. More information, http://valleycity.org/ Noon to 5 p.m. All About Bats! Susan Hambley Nature Center, 1473 Parschen Boulevard, Brunswick. Learn batty facts through crafts and activities. Monday, August 20 National Radio Day https://bit.ly/2sDzUds and World Mosquito Day https://bit.ly/2MAXHA1 6 p.m. to 8:30 p.m. Quilting for Warm Up Medina County; Sew Much Happens, 445 W. Liberty Street, Suite 223, Medina. Bring 100-percent cotton fabric. Bring machine, if possible. Learn how to sew for free while making quilts for those in need. For more information, call 330648-3335. Thursday, August 23 Ride Like the Wind Day https://bit.ly/2tGv5Qf 9:30 a.m. to 11:30 a.m. Camp Wired; Medina Computer Lab, Medina Library, 210 S. Broadway Street, Medina. Learn and refresh computer skills. Ages 55 plus. Call for topics, 330-7250588. 1 p.m. to 6 p.m. American Red Cross Blood Drive; Medina Library, 210 S. Broadway Street, Medina. http://www.redcross.org/local/ohio/ northeast 6:30 p.m. to 8 p.m. Cycling Makes Sense Fitness Ride; ball field parking lot, Buckeye Woods Park, 6335 Wedgewood Road, Medina. Basic tips on cycling and bike maintenance, helmets required. Ride is 6 to 10 miles. Ages 16 and up. Free. No registration. Friday, August 24 Pluto Demoted Day https://bit.ly/2tOqPhX 11 a.m. to 4 p.m. American Red Cross Blood Drive; Brunswick Library, 3649 Center Road, Brunswick. http://www.redcross.org/local/ ohio/northeast 5:30 p.m. to 10 p.m. Bluegrass Jam and Dinner; Lafayette United Methodist Church, 6201 Lafayette Road, Medina. Kitchen opens at 5:30 p.m., music starts at 7 p.m. Donation admission $3, dinner is additional donation request. Bring favorite dessert to share. Bluegrass bands welcome, arrive early to be scheduled. Sunday, August 26 Dog Appreciation Day https://bit.ly/2uHEq7b 3 p.m. to 4 p.m. Natural Discoveries Hiking Series: Summer Wildflowers; Chippewa Inlet Trail North, St. Rt. 42, Lafayette Road. Awardbased hiking program. Walk with naturalist to learn about flowers and pollinators. Dress for weather. Free. Ages 7 to adult. No registration. Submitting Calendar Events Events listed in the calendar must be a festival or fair or hosted by or benefit a non-profit organization in Medina County. Send submissions to Joy@BlakeHousePublishing.com and put CALENDAR in the subject line. Event information is not accepted by phone. The calendar also is available online at JoyofMedinaCounty.com, where it is regularly updated with additional event information. Joy of Medina County Magazine | August 2018 2 p.m. to 7 p.m. American Red Cross Blood Drive; Church of the Nazarene, 743 High Street, Wadsworth. http://www.redcross.org/local/ ohio/northeast 2;30 p.m. to 3:30 p.m. Neon Pens and Painted Pencils; Buckeye Library, 6625 Wolff Road, Medina. Make pencils and neon pens. Grades 6 to 12. No registration. A list of golf outings that benefit area non-profit organizations. To have your golf outing listed, send the information to joy@blakehousepublishing.com at least two months in advance. There is no such thing as too early but there is too late.